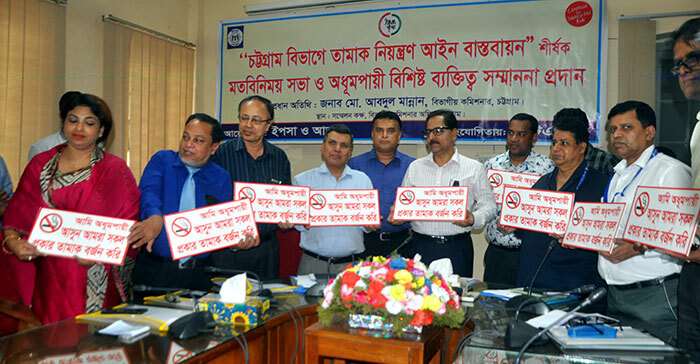 According to the announcement of the Prime Minister of Bangladesh to trim down the use of tobacco in the country, speakers emphasized on taking action plan in every district of Chittagong division, in a meeting titled “Implementation of the Smoking and Tobacco Products Usage (Control) Act, 2005 in Chittagong Division”, held at the Chittagong Divisional Commissioner Office initiated by YPSA on Tuesday. Chittagong Divisional Commissioner Abdul Mannan has been honored as a non-smoking person in the meeting. Alamgir Sabuj, Convener of Anti Tobacco Journalists Association ATMA, Chittagong Division, presided over the function. Chief Executive of YPSA Md. Arifur Rahman made the welcome speech. Additional Divisional Commissioner Shankar Ranjan Saha; Director of Local Government, Chittagong Division, Deepak Chakraborty; Director of Health Departmental Dr. Abul Kashem; senior journalist M Nasirul Haque, and Program Officer of YPSA Omar Shahed Hiru spoke on the occasion while Farhana Idris from YPSA moderated the meeting. Additional Divisional Commissioner (Development) Md. Nurul Alam Nizami; Additional Divisional Commissioner (Revenue) Momin Rashid Amin; Civil Surgeon Dr. Azizur Rahman Siddiqui; Deputy Director of Secondary Education, Chittagong Division, Sultan Mia; District Primary Education Officer Nasrin Sultana also spoke in the meeting. The meeting was called to reduce tobacco uses, especially to stop selling tobacco to children and to conduct mobile courts for stopping tobacco advertising and any type of promotion of tobacco products. The Sanitary Inspector has been urged to play a more effective role and to conduct more awareness programs at the field level. And, the assistant commissioner of the ICT department is given the responsibility of coordinating the tobacco control activities in Chittagong division.